UMASH attended the 2017 Women in Ag Network Conference, “Planning our Future,” at the Willmar Event Center in Willmar, Minnesota. 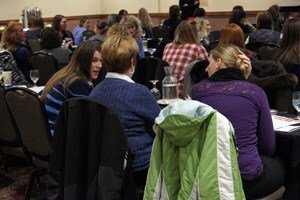 The event was hosted by the University of Minnesota Extension’s Women in Ag Network with support from the North Central Risk Management Center and the USDA National Institute of Food and Agriculture. The Women in Ag Network exists to provide in-depth risk management and business education to women in agriculture.